Where would generations of children be without The Wiggles? That situation might've come to pass if the band whose biggest single debuted this week in 1987 had been more successful. 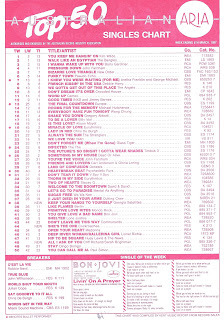 This week in 1987, the song that made it look like The Cockroaches were onto something began its climb into the top 10. But it was a short-lived taste of chart stardom. Speaking of short-lived successes, Kim Wilde and The Bangles both seemed unable to hold onto the number 1 spot for seven days at a time. Once again, "You Keep Me Hangin' On" and "Walk Like An Egyptian" swapped placed this week in 1987. This re-release of one of the '60s sensations' biggest hits coincided with Davy Jones and Pete Tork's tour of Australia, which concluded in April 1987 down the road from where I now live! Last seen in the top 100 in 1982 with a couple of singles from Abracadabra (including the chart-topping title track). 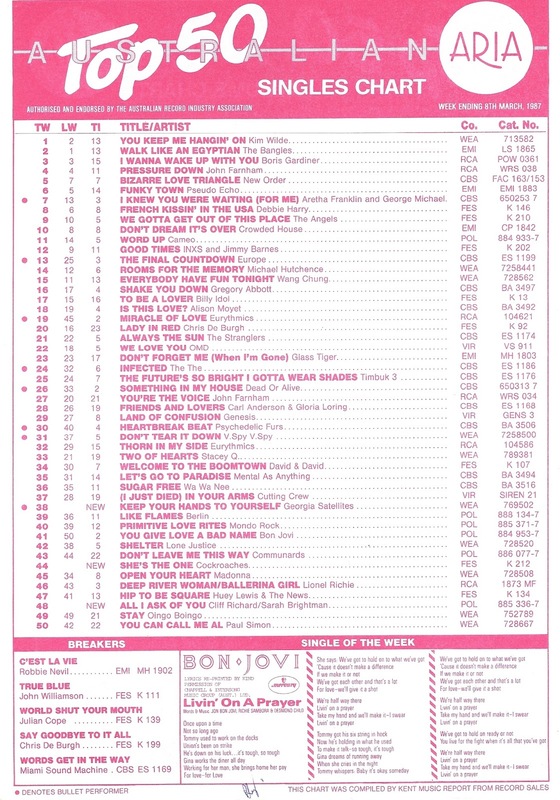 This lead release from Living In The 20th Century features Kenny G.
Eight years before dance music discovered them and they spent six weeks at number 2 with "Missing", this retro-sounding, sophisti-pop tune was EBTG's only ARIA chart appearance. Last week, we saw "The Boy In The Bubble" dent the top 50. It was joined in the bottom half of the top 100 by the title track of Paul Simon's album, which hadn't left the top 5 since the end of October. Since "The Lady In Red" was proving to be quite the stayer - still in the top 20 after 23 weeks in the top 50 - following up the mega-ballad was going to be a difficult task for Chris De Burgh. It made sense to mix things up and release this more rousing track from Into The Light rather than another ballad, but the folk-y "Say Goodbye To It All" proved to have limited appeal. Chris would make one more brief visit to the top 50 in early 1989. Julian Cope was clearly quite fond of the title "World Shut Your Mouth". It was the name of his debut solo album after leaving The Teardrop Explodes (biggest hit: UK top 10 single "Reward") and also the lead single from third album Saint Julian. A bouncy bit of British indie-rock, "World Shut Your Mouth" wouldn't have sounded out of place a few years later amongst tracks like "She Bangs The Drums" and "The Only One I Know", but was possibly a bit ahead of its time in 1987. It's hard to remember a time when the musical version of The Phantom Of The Opera didn't exist, but it was back in October 1986 that the Andrew Lloyd Webber musical had made its stage debut in London. While the cast album didn't come out until 1987, a single of the stage show's big ballad was released to coincide with the premiere - but with Cliff Richard substituted for original cast member Michael Crawford. Why? I'm not sure. Cliff performed alongside Sarah Brightman (aka Mrs Lloyd Webber), who played Christine in the production, and their duet raced to number 3 in Britain in October. "All I Ask Of You" had more of a slow burn in Australia, debuting on the top 100 in mid-December before finally breaking into the top 50 in March 1987. The song then spent 15 weeks inside the top 50, and amassed a total of 37 weeks on the top 100. It was Sarah's first hit in Australia, having missed the top 50 with 1979's "I Lost My Heart To A Starship Trooper", but it would not be her last. No, we had to endure that awful Olympics song in five years' time. Speaking of enduring, see if you can watch the bit in the video of "All I Ask Of You" where Cliff plants one on Sarah without needing to avert your eyes. The week's highest new entry came from an American band whose sound was also a throwback to a bygone era. With its uncomplicated blues rock feel, the debut single by Atlanta's Georgia Satellites was an old-school antidote to the glossy hair metal of bands like Bon Jovi and Mötley Crüe. A number 2 hit in the US (behind, funnily enough, Bon Jovi's "Livin' On A Prayer"), "Keep Your Hands To Yourself" was the first - and biggest - of two ARIA chart hits for the band. The other would come in early 1989 thanks to the Cocktail soundtrack. Next week: Anything Bananarama can do, Chantoozies can... try to emulate. Plus, the debut of a superstar duet that was later re-recorded by a couple of Australian celebs and the second hit for a two-hit wonder. This business of the number 1 and number 2 song swapping places on the charts...I don't recall it happening that often, if at all, in the '90s. Singles would have their time at number 1 then begin their descent without getting to the top again. Was it because the record-buying public was more eager in the '80s? It'd be interesting to find out. It happened once in the 90s. Boombastic went back to number 1 for three more weeks after it was knocked off by Wonderwall following its first week on top. And then it started happening again in the 2000s. Interestingly, Countdown were a week ahead of the published chart at this point, as the Sam Fox-hosted episode aired on this date in 1987 has next week's #1. While I can appreciate it, I'm generally not into 60s music... but I love 'Daydream Believer' and can listen to it on repeat. I've never heard the Steve Miller Band song. It's quite different to 'Abracadabra', but it's not bad. I've only heard a handful of pre-'Missing' EBTG songs, and not this one, which is quite pleasant. I'm surprised 'Graceland' peaked so low, but I guess most people who liked it bought the album. 'Amigos Para Siempre' was indeed awful. I wonder why they went with 'She's the One' instead of 'Hey Let's Go' as the song title?